Scroll down for Vegetarian Suggestion. 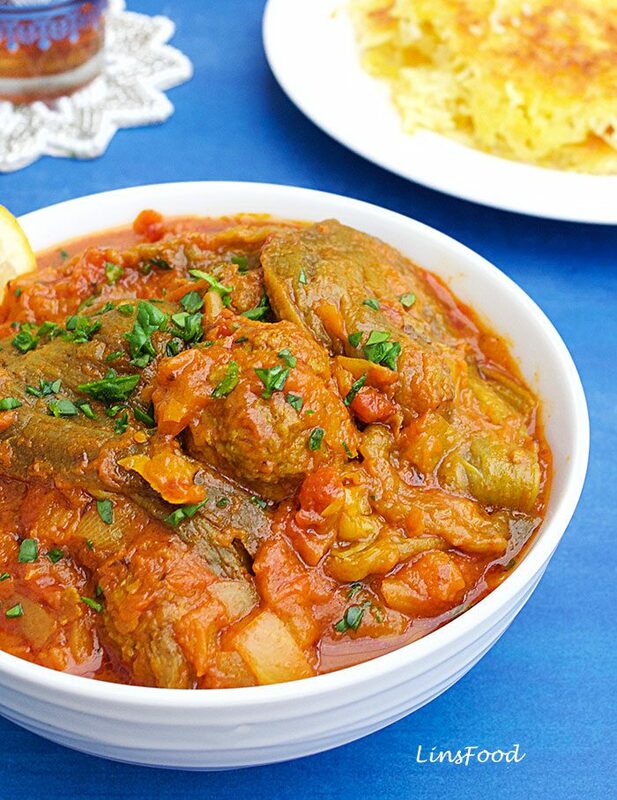 Khoresh Bademjan or Bademjoon is a Persian Eggplant Stew with meltingly soft eggplants in a thick, tomato based sauce with pieces of meat to make it heartier. 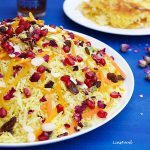 Yellow split peas are also sometimes added, and the dish is known as Gheymeh Bademjan, where minced meat is used instead of chunks of meat. Our recipe today is with just eggplants and meat. This is a reader requested recipe, which I’m very happy to publish, as it’s one of my favourite eggplant dishes, and I love nothing better than to have it with a plate of steamed rice; which is how it’s almost always served. 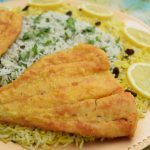 It is a popular party dish in Persian gatherings, and so unsurprisingly, is a favourite with my Persian clients. 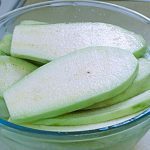 I tend to go with limoo amani, finishing off with a quick squeeze of lemon juice, because I love that touch of bitter that they lend to the stew. If you have friends growing grapes, just ask them for a handful of the young unripe ones to make your khoresh! 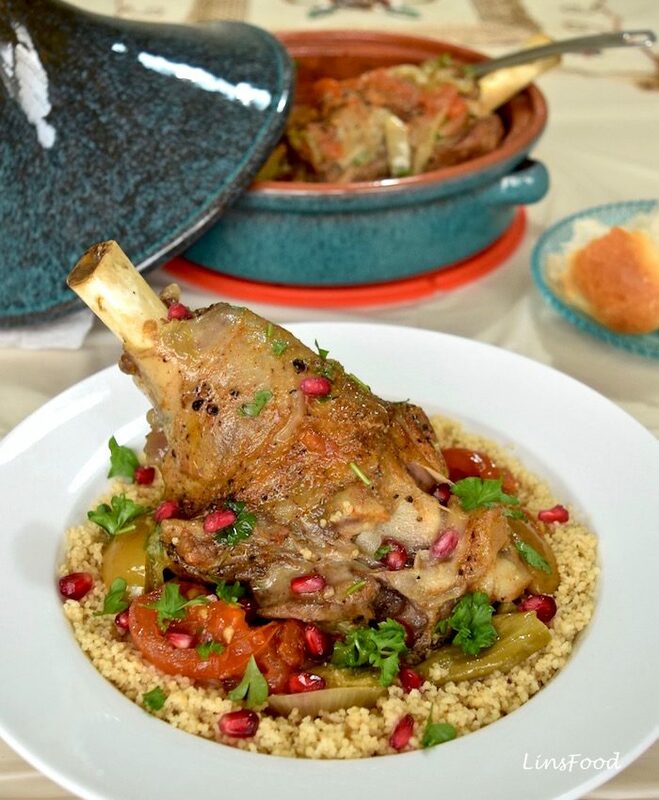 As far as the meat itself is concerned, you can go with either lamb or beef, it’s a matter of preference. Be sure to cut up your beef or lamb into bite size pieces, and, as a change, you could even go with meatballs, which in my experience, makes it very attractive to kids! 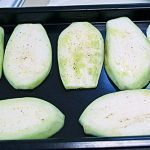 The recipe itself is pretty straightforward, but it takes just a little bit of effort and time, as we salt and then grill the eggplants first. Traditionally, the eggplants are fried, more often than not, but eggplants being the sponges that they are, soak up far too much oil for my comfort. So the best thing to do is to grill (broil) them or bake them in the oven first. We shall be grilling (broiling) them. What kind of eggplants should you use? That’s completely up to you: large, medium, small, round – it depends on what you like and what you can get. 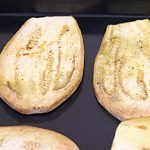 For khoresh bademjan, I use medium eggplants, which slice up to about 5-6 pieces each; perfect for 4 – 6 people. If you fancy a shortcut, you could buy ready grilled slices of eggplants, as the ones here. Or, you could completely skip this process and add the eggplants fresh. The eggplants will be lighter on the flavour, but the stew will be just as delicious. Just remember to cook the eggplants longer, for 30 minutes, to get them to be meltingly soft. These days, eggplants don’t really need to be salted anymore but I find that the extra step helps to season them and deepen the flavour. Having said that, many of the small eggplants here tend to be on the bitter side, so they most certainly need salting for a good 30 minutes. 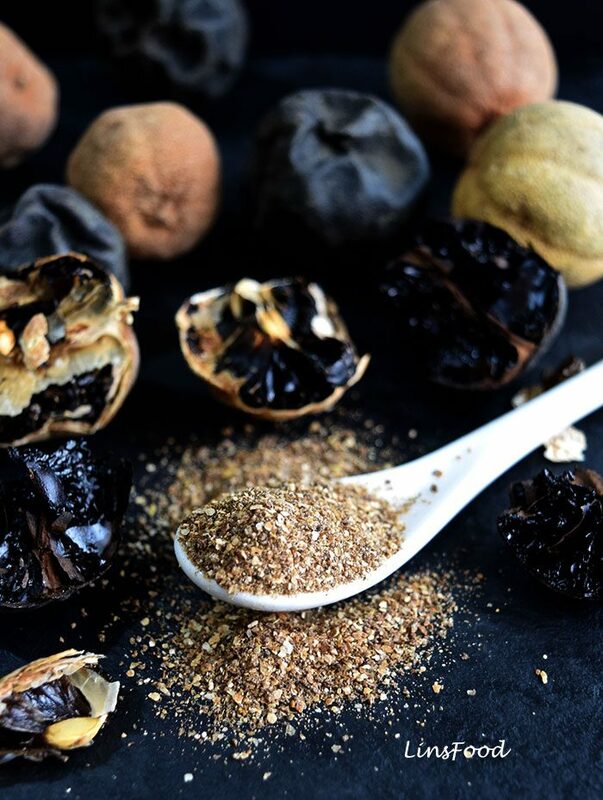 Dried limes, whether brown or black are a very popular ingredient throughout the Middle East and have various names, depending on where you are or where the limes are from. To use them, you simply crack them with the back of a knife to release the flavour, and add them to stews as they are. 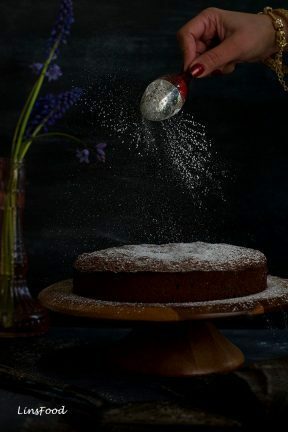 Click here to read more, learn how to make it, and also for my YouTube video. When you only soak the saffron in water, you are not utilising everything that this potent ingredient has to offer. You get the aroma, the flavour and the colour but the very substance of the saffron, to me, remains elusive when you leave it whole. So how do we get to the inner beauty and magic of saffron and how do we make liquid saffron? Easy, we crush those little guys in a pestle and mortar first, with just a tiny pinch of salt or sugar to aid the grinding, then we soak it in water. Is pretty easy to do. Half the time, when I’m cooking this for clients, I am asked to do one of each dish, meat version, and vegetarian version. To make a vegetarian khoresh bademjan, just omit the meat, and add yellow split peas instead, which are traditional in this recipe, as mentioned above. Use about 1 cup of yellow split peas, and follow the recipe below, adding the peas when you are meant to add the meat. Cook the peas for 30 minutes, then add the eggplants and finish up. Yellow split peas do not need soaking. That’s it, I hope you enjoy the recipe. If you are a fan of eggplants, you sure will! 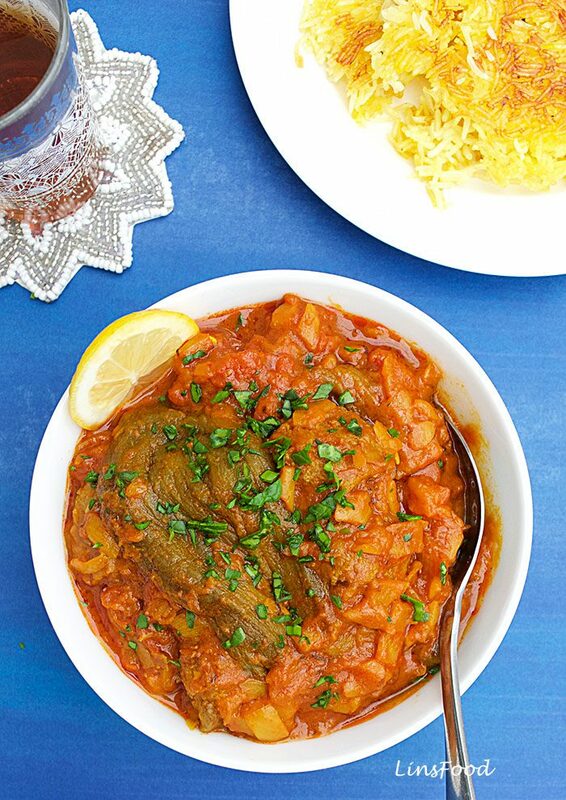 Khoresh Bademjan is a Persian Eggplant Stew made with meat, and perfect served with some rice. Get a large bowl and fill it with cold/cool tap water. Add 1 Tbsp of salt in and squeeze the juice of half the lemon. Peel the eggplants. Then slice them into long pieces, about 1cm (just under 1/2 inch) thick. You'll get about 5-6 pieces per eggplant. Place the sliced eggplants in the bowl of water. 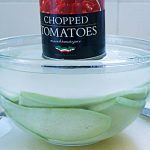 Place a small saucer on the eggplants and weigh down with a can of food, so all the eggplants are submerged in the salted, lemony water. Leave for 20 minutes. While the eggplants are cooking, let's get the beef going. Heat 1 Tbsp of olive oil on medium high heat, and sauté the chopped onions for 2 minutes. Add the garlic and turmeric and stir for 20 seconds. the tomato paste, chopped tomatoes, water and saffron water in. Stir and bring it to a boil. With the back of a knife, pound the limoo amani (dried lime), so that it breaks up into 2-3 pieces. Scoop all this up and add to the stew. Don't worry, the lime will soften and be perfectly edible. Once the stew has come to a boil, reduce the heat right down and simmer for 1 hour or until the meat is just cooked. It will still be cooking for another 20 minutes with the eggplants, so don't overcook it at this stage. While the beef is cooking, let's attend to the eggplants. Rinse and pat dry the eggplants. Using a pastry brush, lightly brush each eggplant with olive oil and place under the grill (broiler) on high. Grill for 15 minutes, flipping them halfway through. Set aside until the beef is ready. When the beef is done, add the eggplants to the stew, bring back to a boil, then lower the heat and simmer for 20 minutes, until the eggplants are fully cooked and soft. Check the seasoning, and add more salt if you think it needs it. Be careful when you stir the salt in, don't break up the super soft eggplants. Add some freshly ground black pepper and top with parsley if you like, and serve with some plain white rice, or some Saffron Rice. I have life threatening high blood pressure. Too much the salt! Is the salt needed to tenderise the eggplant or can I just submerge it in water… and it’s in a bowl, and you put a saucer and a can no top of it… but you say let it cook? I missed the part where you put it in a pot and cook it! I’m confused! Do you cook it in the bowl, or in a pot? How in the bowl? microwave the bowl? Won’t the can throw off un sparks? The salt isn’t consumed, it’s only in the water, which is then thrown away. You can skip this step, as I mentioned in the post itself. That’s step no 2. Step no 3 says cook the beef, not the eggplant. We only cook the eggplants in step no 8, where we rinse and pat dry before placing under the grill/broiler. Thank you, Azlin, we are looking forward to Nowruz. I am so glad you have the recipe for Polo Mahi Sabzi. 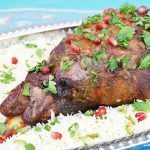 I love all your Middle Eastern recipes! 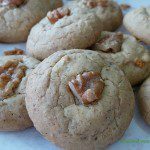 Fantastic, thank you for this recipe. I’m going to try the vegan version! Yummy, I can’t wait to try this. My children don’t eat red meat, can I make this with chicken, Azlin? Hi Rose, yes, you can. I’ve done that quite a few times for people who don’t eat beef or lamb. Great, I love aubergines, and get excited when I see a new recipe. Pencilled in for the weekend. Cheers! A pleasure, James. Always good to meet another person who says “aubergines”! Yay, thank you! I remember granny making this when I was little. 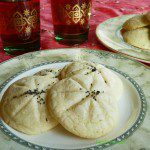 I really appreciate all these Persian recipes you are sharing. Printing this to make tomorrow! That’s wonderful Farzana, let me know how it goes.